I’ve been feeling a bit like I’m in a make-up rut recently, which isn’t totally a bad thing – I’ve found a selection of products that I like and work for me. But then, my inner beauty junkie starts to crave something new, wanting to try something else out (even if I’ve already found a product I love) and I know I have to mix it up a bit. So this week I’ve been using a whole collection of new products (well, new to me). I delved into my drawer of ‘not tested’ bits and bobs and pulled out a whole face of the day using these (with the one exceptions of MAC strobe cream – I have used this before). Now, despite the fact that I was trying to break out of my ‘safe neutrals’ rut, I do still seem to have come up with a look that’s pretty much safe neutral… but baby steps! I will embrace colour eventually! L-R Bottom Row: UNE Lip Toned Colour in ‘L02’, Avon Supershock Gel Eyeliner in ‘black’, MAC brow set gel. Not my greatest FOTD photos… but here we go. Here’s my mug in natural light. The Shu Uemura Under Base Mousse – an odd, but amazing product. I forgot to include the blusher I used in the photos, but it was Max Factor Cream Blush in Soft Murano – lovely product, really amazing to blend and leaves cheeks with a healthy glow that lasts all day. Could also double up as a lip shade. It felt really good to use a whole face of new products! Quite refreshing, and has definitely helped shake the ‘in a rut’ feeling. I also discovered that I really like the Nars concealer – for some reason I expected it to be a bit heavy and not suitable for the under eye area, but I found it amazingly light and blend able – I’m really impressed. 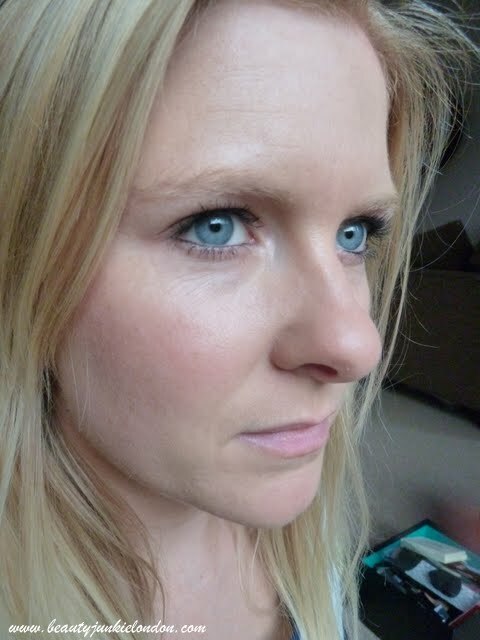 In fact, I felt generally impressed with all the products – the only ones I didn’t immediately love are the Smashbox eyeliner (because it was a bit fiddly and caused some fallout on tops of my cheeks) and the Cargo Mascara – Great colour but took some work to get the lashes looking as long and defined as I like. 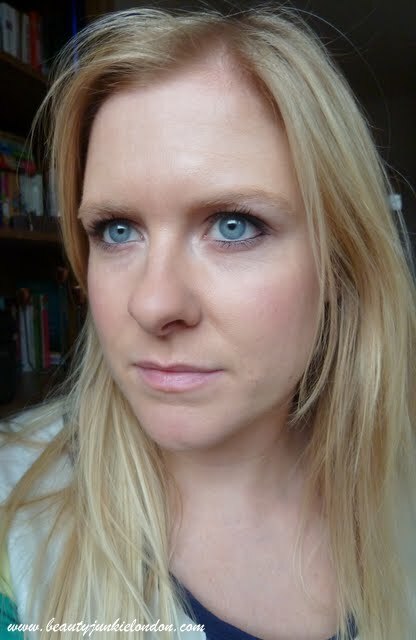 So there we have it – my initial thoughts for my ‘new’ face of the day! I’m going to try and mix it up a bit more make-up wise…! What do you do when you feel stuck in a make-up rut??? Products marked with a * are PR samples. Previous Post New beauty gadget…can you guess what it is yet? Next Post Can you guess what it is yet?…. Revealed! 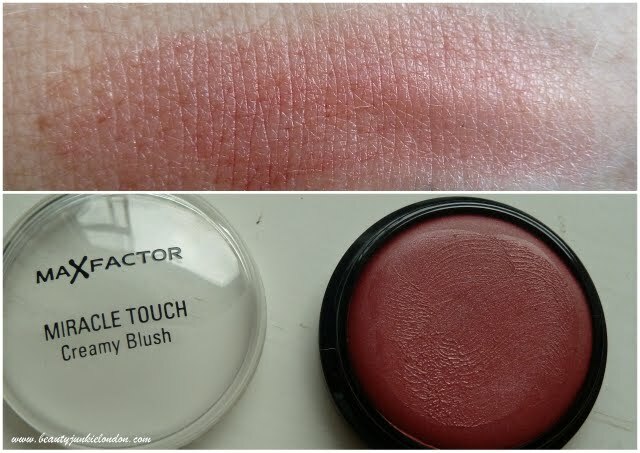 I love the shade of the Max Factor blush, looks like an Illamasqua dupe! I love how you created a whole FOTD look with mostly untried products – that’s the mark of a real beauty junkie 😉 MAC Strobe is a fun product – I have it too but haven’t used it in ages! I’m awful for getting stuck in a makeup rut – once I love something I stick with it but have been taking small baby steps with a different blush everyday. It’s hard too cos I don’t tend to wear eye makeup except mascara so can’t change that up really. Your skin looks amazing! I’m thinking of getting the Healthy Mix Serum as I love the normal Healthy Mix!